My salt baked fish is dry cured first with a hint of Indian spice then covered in a salt crust and baked in the oven. The assembly of this salmon recipe is fun but the reveal is what gives you the ‘oohs’ and ‘aahs’. Have a look at the picture of the salmon before the salt is removed. Salt baked salmon is wonderful, in fact anything salt crusted is wonderful. My salt dough recipe is really easy to make and can be used to insulate pretty much any ingredient; although salt baked fish is one of my favourites. Once you’ve mastered your salt dough recipe (and you can see my salt dough recipe below) you can simply pack this around any number of foods cooked whole. I first came across salt baked fish whilst travelling through Laos, Vientiane to be specific. We were sitting at a little plastic table and chair street food stall right on the edge of the Mekong river and these guys were dishing out salt crusted fish (I’m not sure what fish exactly, but a white fish bit like seabass). Once the salt crusted shell was cracked open the fish was so succulent and delicious and simple. It was a very pure dish that I knew I’d have to recreate it, so here is my salt baked fish recipe just for you! In my recipe, cracking open the solid salt crust shell releases a delicate spiced aroma and reveals the most succulent, firm, delicious salmon. A whole salmon or trout also works very well with this method of cooking – in fact it works alot better that a fillet. Cover the salmon with the dry cure blend, rubbing the cure into the flesh of the salmon and cover fully in the cure. If using a whole fish then just fill the cavity of the fish with the curing mixture. After 45 minutes of curing time, remove the salmon and quickly wash off the cure thoroughly in gentle running water. Then dry (I wrap mine in a kitchen towel). While the salmon is drying make your salt dough / salt crust. Simply tip all the course salt into a bowl and break the egg whites into the salt. You want the consistency of wet sand and depending on the size of your eggs you may need two or three. Mix together with your hands until consistency is reached. On a piece of baking paper on a roasting tray, create a salt crust bed to place the salmon on skin side down. Then totally cover the entire fish with the salt crust. Put in an oven at 200 for approx 25 minutes (you can check by placing a knife into the fish and then touching the tip against your lip to see if it is warm). Remove from the oven and crack open the crust with the back of a knife to reveal the fish and remove from the salt crust – this is the bit that is quite fun to do with your diners for the theatre of it all! 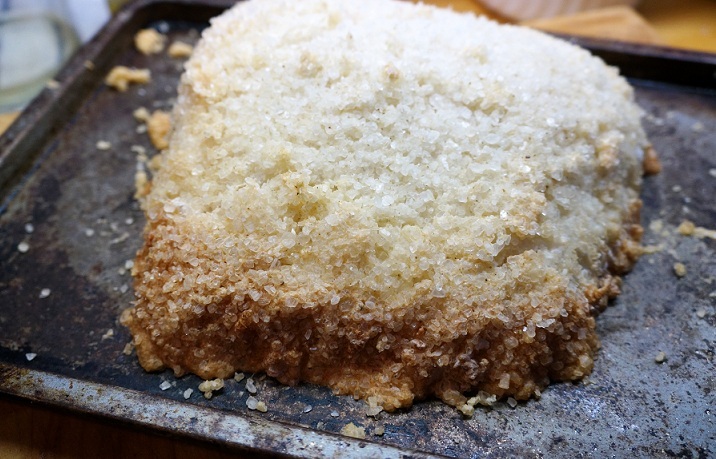 Tip – use a pastry brush to gently sweep off any large salt crumbs. Then before plating up; drizzle a little of the maple syrup over the salmon and wipe it over the top of salmon with a back of a spoon. This isn’t a sauce, it is just a very delicate means of adding a hint of subtle sweetness. Goes well with rosemary roast potatoes and a light green salad and the obligatory “I thought it would taste really salty but it doesn’t does it?” question.